Watermarks can significantly increase the value of a stamp. For example, Canada stamp #28 in Mint VF (Unitrade listing) has a catalogue value of $1,400, but the same stamp with a watermark (#28a), is listed at $6,000! Obviously, it’s a good thing to find a stamp with a watermark. It can mean the difference between an ordinary stamp and a rarity. 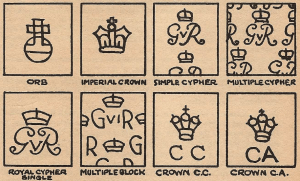 So then, what is a stamp watermark? 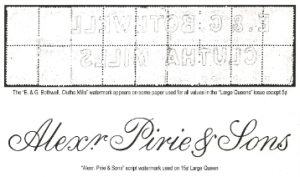 Watermarks are designs or patterns that appear in the actual paper of the stamp. They are not designs that have been printed onto the stamp. Watermarks are created during the paper-making process. When a sheet of paper is being made, it is a mass of wet pulpy fibers laying in a tray. Before the pulp is completely dried into paper, metal wires (or «bits») attached to the Dandy roll of a paper-making machine are pressed into the surface of the wet pulp; the pressure from the bits thins the papers’ surface where the wires make contact. This «thinning» produces a watermark. The bits can be twisted into different designs and these designs can be seen on the back of a stamp. Watermarks were generally used as a way of preventing counterfeiting. They appear on early stamps of the late 18th and early 19th century of many countries, including some early Canada stamps. Watermarks can be tricky to spot since they are essentially just a thinner part of the paper and not an inked design. Sometimes you can see them by holding your stamp up to a bright light, with the back of the stamp facing you. If this doesn’t work, you can use a watermark tray and fluid. Place your stamp face down in a black watermark tray and apply enough drops of watermark fluid to saturate your stamp. Once your stamp is wet, the black of the tray will show through the thinner paper of the watermark allowing you to view it temporarily. Once your stamp dries, the watermark disappears again. As opposed to some other liquids, watermark fluid is safe to use and won’t ruin your stamps nor affect the gum. Watermarks come in many different shapes and sizes. They can be flowers, coat-of-arms, animals, letters, crowns, or simply the name of the paper-maker. Watermarks on Canada stamps are sheet watermarks which display the paper-maker’s name. Sheet: when a large watermark has been applied to an entire sheet of stamps, so parts of the design overlap onto some of the stamps on the sheet. Therefore only a small portion of the design is visible on some individual stamps. Stitch: an accidental watermark which occurs when the seam of the drying belt transfers onto the wet pulp during the paper-making process. Unitrade Catalogue listings can help you determine which Canada stamps in your collection might have a watermark.